What is the Pulse of the City News Customer Satisfaction Award? The Pulse of the City News Customer Satisfaction Award was established to spotlight building and construction companies providing a top-level customer experience to their customers. Our research is done annually, and companies earning a 4- to 5-star rating are honored with the award and receive a unique Star Page on our website. How does a company earn its rating? You are known in your field for excellent customer care. Customers and other industry members post comments and feedback online and make their opinions known in other channels, including our nomination process. Our research team collects those comments and ratings, and reviews a host of online and other sources including blogs, review websites, social networks, and rating services. The data is then analyzed to determine a company’s star rating. Our database of performance information has been compiled on an ongoing basis since 2009, so it is more than a snapshot of “what did they do last?” Our process is designed to separate the reality from the smoke and noise to which many other rating systems succumb. Do companies have to pay for their rating? No. There is no fee to be rated. And paying us money does not buy you a higher rating. We publish the award status on a unique Star Page on our website at no charge for all companies earning the highest possible ratings of 4 to 5 stars. Our ratings cannot be bought — they must be earned in the marketplace by providing superior customer service as identified by our independent research. Why does Pulse of the City News research our customer service levels and publish it at no charge? We like excellence, especially in customer service. Showcasing companies that excel will only raise the industry level of customer experience awareness and satisfaction. That’s a good thing. We don’t need to be paid for that good thing. If our rating result was influenced by payment, it would lose credibility. Not charging for the research, and isolating the ratings research process from any commercial relationship we have with Stars, ensures the newsworthy integrity of our research and reporting. Does Pulse of the City News sell anything? Yes. We sell services and products to qualified service “stars.” For companies earning our highest ratings for customer service, we sell promotional and other services and products that expand their business. This supports our extensive research and publishing activity and is consistent with our commitment to encourage and increase excellence. What is the value of Pulse’s research? Our publishers have been covering customer service and the building industry for more than 20 years. It is our goal and commitment to recognize those companies that provide excellence in customer service and give them the tools and third-party-credible rating that previously only big business has been able to buy. Now small and mid-size companies have access to research and tools needed to flourish. How will my business benefit from the award and subsequent recognition? The Pulse of the City Customer Satisfaction Award informs others that your customers have been very satisfied. This gives both current and new customers added confidence in selecting your company for their next project. It also provides positive reinforcement for your staff members that their hard work is paying off, and motivates them to continue providing top-level customer service. How can my business benefit even more? Leverage your award news and status through our promotional programs and services exclusively marketed to award winners. How do I promote my business best? 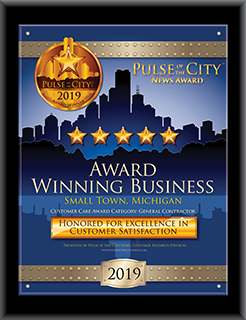 As a Pulse of the City Customer Satisfaction Award Winner, you have access to our marketing materials that were designed to help you manage your reputation and attract and retain customers and employees. We have a step-by-step program that will help you best utilize your award. How long will it take to receive the award materials I ordered? The standard delivery time on custom products is 4-6 weeks. Press releases and company profiles may take more or less time based on collaboration between our writers and your company. How do my customers hear about the award and my company? We publish our research findings and issue periodic press releases. Although those do benefit all star-rated companies, those that benefit the most are the ones that become involved in their own marketing and leverage the award status in their own marketing. We provide you with an opportunity and materials to market. Your engagement in your own marketing will best get your business and its award in front of your customers and prospects. We have several tools and suggestions to help you in this effort that are included here. Additionally, we distribute press releases to news services announcing the awards regularly. These releases can be targeted to specific media outlets by working with your Pulse marketing representative. Where do you get the information used in the ratings? Our research team analyzes data from multiple online and other sources including consumer and business user-review websites, blogs, websites, social media sites, industry literature and associations, nominations, and rating services. Are there any special products to thank our customers? Yes, we have appreciation certificates and plaques designed to thank your customers and referral sources as well as to recognize your staff. What is the relationship between Pulse of the City News’ rating process and its commercial services? Pulse markets promotional services to award-winning companies, but there are no “points” earned in our rating system granted to the companies that retain our services, and no penalty rating for those who do not. The revenue from sales of our promotional services does underwrite the large cost of data collection and rating services, but in terms of their value to Star Award winners based on increasing the revenues and profitability of those Stars, our promotional services stand on their own merits.